They might as well meet in Antarctica instead of difficult to get to Newtown HS in Queens, where an increasingly panicy Tweed has moved the Dec 14 PEP meeting, which will decide on 2 Success charter Brooklyn invasions, from Fashion Industries HS in midtown Manhattan. They claim this is for Queens parents when as of this time no issues related to Queens schools are on the agenda (though they did dig something up to try to cover their asses). WalBloom are making a clear attempt to shut out the voices of Brooklyn parents whose choice (the buzz word of ed deformers) is to NOT have an Eva Moskowitz school in their neighborhood. Last night's protests over another Success Academy invasion, this time in gentrified Cobble Hill in Brooklyn, is a wake-up call. Tweed is counting on them to show up sparingly at Newtown HS while Eva sends in rented buses full of food and other goodies to get her people there. There will be growing demands to move the meeting back to a more accessible location. The key will be whether the press picks up on the obvious intent of this move. But with growing awareness of the outrageous machinations going on at Tweed and with communities in Dist 15 (western bklyn) and Dist 14 (northern) joining forces and organizing, along with outreach to Occupy Wall St educators, this may not turn out to be a cakewalk for Eva and Tweed. She has stepped on communities that just may have the resources and leadership, along with the diversity to engage in an effective long-term battle even after she gets her school, which is a given. Some forms of civil disobedience are not out of the question as anger grows. This is one PR war that Eva and Tweed will have to work very hard to win even with a press biased in favor of Tweed. But then again do they really have to worry about this issue? Eva will try to paint the opposition as a Uft op but the uft fingerprints are light even if they have a rooting interest. But with the move to Newtown we just may see the uft jump in with their own buses, though the press will paint this Eva's way as uft vs her. The UFT has jumped into the battle in Harlem at PS 241. Here is some press coverage of last night's meeting. Look for my follow-up post of comments from parents Karen Sprowal and Noah Gotbaum on the press coverage where he points out that 90 percent against and a few lone voices for are presented as a "divided" community. Good video of Brian Jones at (NY1) also some video at GothamSchools; both stories below. The Department of Education held a meeting Tuesday at K293 in Cobble Hill to discuss a proposed 190-seat charter school that would be housed in the building, and opponents butted heads with supporters as dozens signed up to speak. NY1's Zack Fink filed the following report. The K293 building in Cobble Hill is already home to two secondary schools and one special education program, but Department of Education officials say there's still space for 700 students. Success Academy Charter Schools wants to use up 190 of those spots for a charter that would serve kindergarten through fourth grade. Some parents say they're behind that idea. "2007 was a boom for Brooklyn. Lots and lots of babies. And we all need to go to elementary school. Some of us have great options in this neighborhood, others have less than stellar options, and it's my ethical responsibility to find a good school for my son. So I'm supporting the charter school," said parent Liz Williams. But there were some fierce opponents at a public hearing Tuesday night. About 70 people signed up to speak, some of whom claimed to be part of the Occupy Wall Street movement. One person was ejected. For other opponents, the issue is about how public resources are allocated. "Unfortunately, the DOE doesn't seem to put the same priority, love and interest in building up the public schools that they do with charters, and it just raises a lot of questions," said teacher Brian Jones. "Why do they have to come into public school buildings, why do we have to have a competitive system of education?" A competing plan is also on the table for the space. Elected officials and others want to use it for an early childhood education program. "There is an enormous need in this district for pre-K and K classes. They are all oversubscribed. You even have to pay a lot of money to go to private pre-K and K, and they are oversubscribed, too," saod Assemblywoman Joan Millman. The panel for educational policy has scheduled a vote on the co-location for December 14. Mayor Michael Bloomberg, who has been supportive, controls a majority of votes on the panel, and the co-location is expected to be approved. Many of the attendees who lined up outside Brooklyn Tech for last February's Panel for Educational Policy meeting came to protest the creation of a Success Academy Charter School on the Upper West Side. Back-to-back rallies set for this afternoon augur a contentious co-location hearing for the newest outpost in the Success Charter Network. The creation of Cobble Hill Success Academy, which won approval earlier this year to open next fall in Brooklyn's District 13, has sparked conflict in District 15, the location of the school's proposed site. Advocates and critics of the city's plan to co-locate the charter school with two secondary schools and a special education program will lay out their cases during tonight's public hearing — and beforehand, in rallies set for outside the Baltic Street building. The public hearing is the first of the year and ushers in a season of rancorous co-location hearings. Some families have lamented crowding in high-performing local elementary schools and said they would appreciate new options. But others say they are worried that the new school would strain resources at the proposed site without effectively serving the high-needs populations it was originally intended to serve. Cobble Hill Success's promise to serve low-income, immigrant families in District 13 was a boon to its application, according to Pedro Noguera, an education professor who green-lighted the school's original application as a member of the State University of New York's Charter Schools Institute. "We have tried to take the position recently that we can put charter schools where there is clearly a need for better schools for kids, so targeting the more disadvantaged communities. We have also seen the areas that are a saturation of charter schools, so we want to encourage them to open in areas that have a high need and aren't being served," said Noguera, who will be participating in an education debate this evening in the West Village. "A school in Cobble Hill clearly does not meet that criteria." At 5 p.m. parents from District 15 will hold a press conference outside of the Cobble Hill school, "to demand the City's Department of Education award public space to Success Academy Cobble Hill," according to a press release sent out by a communications firm that works with the Success Academy Charter Network. The network's CEO, Eva Moskowitz, has seemed to court controversy when seeking spacefor her schools. Co-location battles have followed her forays into schools in Brooklyn, Harlem, and the Upper West Side, and the network has in the past bused groups of parents from its schools, often wearing signature orange T-shirts, to co-location hearings. At 5:30 p.m., opponents of the co-location are planning to rally in front of the school to renew calls for an alternative proposal: to open an early childhood center in the building instead of a charter school. Yesterday a vocal group of parents, state and union officials rallied at the building's Baltic Street entrance in support of that proposal, arguing that the local elementary schools are turning away families who apply for preschool. Organizers of the protest say they will argue that the charter school would not address crowding issues in Brownstone Brooklyn's elementary schools because its tlottery admissions would allow students from other parts of the city to apply, and it also would not address the demand for more preschool programs. Community members and educators from the two secondary schools that currently share space in the four-story building, along with a District 75 special education program, have also said that an additional charter school could overcrowd the high schools' shared facilities. Its spreading! Wash State occupiers actually tried to issue a "citizens arrest" of the state legislature because of its violation of the constitution guaranteeing a right to education. It looks as though the teacher who led the mic check was instead arrested. Outrageous. Common CoreThis is a top-down agenda devised by Coleman/Gates in two ways and that “distort early learning” acc. to early childhood expert quoted below. Coleman, who never taught a day in his life, started at what he believed should be demanded of college students and worked downwards to Kindergarten – which resulted in the requirement that that all Kindergarteners be able to read, among other things, which simply is not developmentally appropriate acc. to many experts. Here are some:Spyros Konstantopoulos and Vicki Chun, “What Are the Long-Term Effects of Small Classes on the Achievement Gap? Evidence from the Lasting Benefits Study,” American Journal of Education 116, November 2009. Peter Blatchford et.al. “Do low attaining and younger students benefit most from small classes? Results from a systematic observation study of class size effects on pupil classroom engagement and teacher pupil interaction Philip Babcock and Julian R. Betts, “Reduced-class Distinctions: Effort, Ability and the Education Production Function,” NBER Working paper 14777, March 2009. Results indicate that small classes elicit enhanced effort and engagement by disadvantaged students. Thomas Dee and Martin West, “The Non-Cognitive Returns to Class Size, ” NBER Working Paper 13994, 2008. “Alan B. Krueger, Economic Considerations and Class Size, The Economic Journal, 113 (February 2003). Jeremy D. Finn et.al., “Small Classes in the Early Grades, Academic Achievement, and Graduating From High School,” Journal of Educational Psychology, 2005. An oldie but goodie. We used Arne Duncan's Hurricane Katrina was the best thing to happen to New Orleans.
."Let's hope the fiscal crisis doesn't get better too soon. It'll slow down reform." -- Tom Watkins, a consultant, summarizes the corporate education reform movement's current strategy to the Sunday New York Times. The Shock Doctrine, as articulated by journalist Naomi Klein, describes the process by which corporate interests use catastrophes as instruments to maximize their profit. Sometimes the events they use are natural (earthquakes), sometimes they are human-created (the 9/11 attacks) and sometimes they are a bit of both (hurricanes made stronger by human-intensified global climate change). Regardless of the particular cataclysm, though, the Shock Doctrine suggests that in the aftermath of a calamity, there is always corporate method in the smoldering madness - a method based in Disaster Capitalism. Though Klein's book provides much evidence of the Shock Doctrine, the Disaster Capitalists rarely come out and acknowledge their strategy. That's why Watkins' outburst of candor, buried in this front-page New York Times article yesterday, is so important: It shows that the recession and its corresponding shock to school budgets is being used by corporations to maximize revenues, all under the gauzy banner of "reform." Some background: The Times piece follows a recentEducation Week report showing that as U.S. school systems are laying off teachers, letting schoolhouses crumble, and increasing class sizes, high-tech firms are hitting the public-subsidy jackpot thanks to corporate "reformers'" successful push for more "data-driven" standardized tests (more on that in a second) and more technology in the classrooms. Essentially, as the overall spending pie for public schools is shrinking, the piece of the pie for high-tech companies -- who make big campaign contributions to education policymakers -- is getting much bigger, while the piece of the pie for traditional education (teachers, school infrastructure, text books, etc.) is getting smaller. The Times on Sunday added some key -- and somehow, largely overlooked -- context to this reportage: namely, that the spending shift isn't producing better achievement results on the very standardized tests the high-tech industry celebrates and makes money off of. "In a nutshell," reports the Times, "schools are spending billions on technology, even as they cut budgets and lay off teachers, with little proof that this approach is improving basic learning." The paper adds that the successful "pressure to push technology into the classroom without proof of its value has deep roots" going back more than a decade, which raises the fundamental question: Why? Why would this push be so successful in changing education policy if there is little hard evidence that it is the right move to improve student achievement? The answer goes back -- as it so often does -- to corporate power and the Shock Doctrine. Tech companies give the politicians who set education policy lots of campaign contributions, and in exchange, those politicians have returned the favor by citing tough economic times over the last decade as a rationale to wage an aggressive attack on traditional public education. That attack has included everything from demonizing teachers; to siphoning public money to privately administered schools; to funneling more of the money still left in public schools to private high-tech companies. This trend is no accidental convergence of economic disaster and high-minded policy. On the contrary, it is a deliberate strategy by corporate executives and their political puppets, a strategy that uses the disaster of recession-era budget cuts as a means of justifying radical policies, knowing that the disaster will have shellshocked observers asking far fewer questions about data and actual results. As the Times sums it up, the recession's "resource squeeze presents an opportunity" for corporate interests. Or as Watkins explains, social pain is an opportunity: "Let's hope the fiscal crisis doesn't get better too soon. It'll slow down reform." For sheer weapons-grade assholishness, Watkins' publicly wishing for a crushing recession to continue ranks up there with such gems as "bring them on" and "let them eat cake." However, the real news here is that a Disaster Capitalist has spoken the unspoken and clearly articulated the Shock Doctrine in all its hideous glory. In this case, he has told us what the "reform" movement to demonize teachers, undermine public education, and generate private profits from public schools is really all about: It is about using the shock of a fiscal crisis to enact a radical, unproven but highly profitable agenda that corporate forces fully know they cannot pass under non-emergency circumstances, when objective scrutiny would be much more intense. Indeed, corporate "reformers"are so reliant on the Shock Doctrine to glaze over uncomfortable questions about their agenda, that they are now praying that the shock of recession continues. Karen Cator, director of the office of educational technology in the United States Department of Education, said standardized test scores were an inadequate measure of the value of technology in schools. Ms. Cator, a former executive at Apple Computer, said that better measurement tools were needed but, in the meantime, schools knew what students needed. Cator, of course, is making the argument that supporters of traditional public education have been making against corporate "reformers" for years -- namely, that standardized tests cannot be the primary tool to measure overall educational achievement, because they do not measure other equally important skills. And the fact that she is selectively making it in defense of her former technology industry tells us a lot about how public policy is really made in America. Recall that this statement against standardized testing comes from the same Obama administration that has been pushing for more standardized testing -- the same Obama administration that wants to use standardized testing as a key metric for withholding federal aid from "failing" schools and for firing teachers. That's right, somehow, according to the Obama administration, standardized tests are the perfect tool to judge and punish struggling schools and the teachers who work with low-income kids, but they can't be used to similarly judge technology products that are making Obama's high-tech donors lots of cash. In this oxymoron, we see who the corporate "reformers" in government really believe they work for, and whom they shape public policy on behalf of. It's not the average parent or student or voter. It's the Disaster Capitalists, who now have their sights set on your local schoolhouse. Note: Steven Brill, the author of the new book "Class Warfare," and Dana Goldstein, the Nation magazine's education reporter, will be debating these and other education issues on my KKZN-AM760 radio show at 9 a.m. ET on Sept. 7. Stream it live or podcast it atsirota.am760.net. FIGHT EVA INVASION THIS TUESDAY November 29th Brooklyn charter co-location hearing COME OUT!! Evil is like the Bubonic Plague. I know some of you view E4E as a threat but it's not even close. With the UFT fearing confrontations with Eva organized opposition has to come from somewhere - though Eva will claim the uft is behind anything - even in the face of groups like GEM that the uft does not exactly like. I claim one of the reasons the uft ignores our film is the strong stand opposing charters, ironic in that other teacher unions, universities and parent activists seem to agree with us. 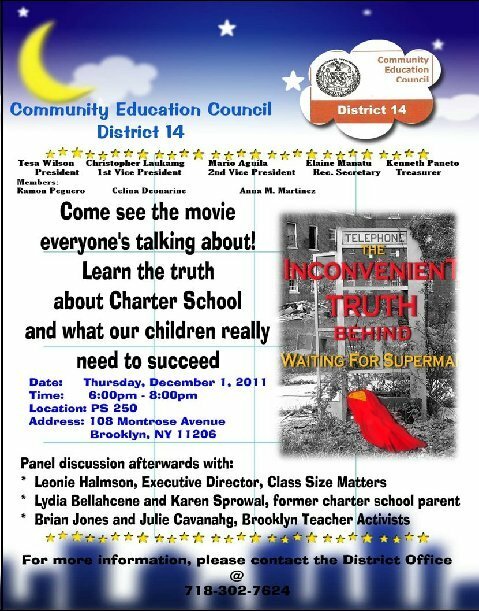 While the UFt ignores GEM's "Inconvenient Truth Behind Waiting for Superman" not only because if the criticism of the UFT but for its straight to the gut message on charter schools (the UFT wants to make nice with the sledge hammer being used to destroy public ed), communities being invaded by charters are starting to use the film to educate the local community. A few weeks ago there was a screening in District 15's Cobble Hill which is being invaded by an Eva Moskowitz charter. And now the CEC of D. 14 which is a major target of Success Charters due to its gentrification - nice pickings of public ed money to teach mostly white middle class kids - is doing the same. PS 250 at 6PM followed by a panel discussion. Call the District Office for info. There's another screening in CEC 3 at PS 75M on Dec. 7 - 735 West End Ave. Details will be up on Ed Notes a few days before. Instant Teachers - Why Wait Even Six Weeks? Mr. Arrington, in the middle of his third month of teaching at the Advanced Technology Complex in the Denton Independent School District, has a background well suited to the subject. He was a police officer for six years — he turned in his badge on Sept. 12 and began teaching the next day. NOTE In April 2011, Matthew McKnight was an intern at The New Republic, writing False Choice: How private school vouchers might harm minority students. In this New Yorkerpiece, good for him for highlighting Joanne Barkan's article. More questionable is his casual conclusion that KIPP produces "admirable results." This is still an open question. For all the contention brought about by the O.W.S. protests, most observers and commenters agree that the movement’s one success has been to shift the national conversation—inasmuch as there is one—to words like “poverty” and "inequality." Still, since the early occupations, calls for the protesters to give specifics to underline their shouting have resounded. And in the months of occupation, the financial and political structures that created and support such drastic inequality have been widely reported on and scrutinized. One, though—the privatization of public education, in the name of reform—has received less attention. On Monday, the Walton Family Foundation announced its plan to donate twenty-five and a half million dollars to the Knowledge is Power Program (K.I.P.P. ), a national network of charter schools that many believe to be among the best in the nation. Surely, a lot of good can come from that amount of money. With its latest grant, the W.F.F. aims to "double the number of students attending K.I.P.P. public charter schools," reaching fifty-nine thousand students by 2015. More broadly, the foundation, according to its press release, seeks to help K.I.P.P. "transform public education in our nation." But what is the nature of that transformation? In its Winter 2011 issue, Dissent magazine published an in-depth look into the control that three prominent foundations (Bill and Melinda Gates, Eli and Edythe Broad, and the Walton Family) exert over the substance, direction, and quality of education "reform." Whatever nuances differentiate the motivations of the Big Three, their market-based goals for overhauling public education coincide: choice, competition, deregulation, accountability, and data-based decision-making. And they fund the same vehicles to achieve their goals: charter schools, high-stakes standardized testing for students, merit pay for teachers whose students improve their test scores, firing teachers and closing schools when scores don’t rise adequately, and longitudinal data collection on the performance of every student and teacher. "The imperious overreaching of the Big Three undermines democracy just as surely as it damages public education.' As many school districts—and members of Congress--push to privatize public education, the money and foundations behind such crusades often gain considerable control and face little backlash if their plans fail. The departure of low-performing students helps K.I.P.P. improve its aggregate results. Unlike local school districts, K.I.P.P. is not replacing the students who are leaving. When a student returns to a traditional public school after the autumn head count, K.I.P.P. retains all or most of the money -- allocated for educating that student during that school year. K.I.P.P. responded with its own pair of studies to rebut those findings: "Our impact estimates reflect the effect of ever having enrolled at K.I.P.P., even if a student subsequently withdraws" and "if struggling students who leave K.I.P.P. are replaced by incoming struggling students from other schools -- there will be no selection effects arising from attrition/retention." At the same time, the schools tend to admit fewer "late-entry" students than those who leave before graduating. The studies, commissioned by K.I.P.P. did not, however, respond to the claim that K.I.P.P. retains funds after a student leaves the school network. Looking at charter schools in general, it is far from certain whether or not charters perform better than public schools. Studies by Stanford University (2009) and theInstitute of Education Sciences (2010) have yielded mixed results when comparing the two. But, even such a comparison is too myopic. The better question: Why do some schools—or types of schools—perform better than others? Foundation grants—however much they might help one, or a particular set of schools—are neither sustainable nor scalable enough to address the growing inequalities in education. So, at the very least, it's worth asking if, in doubling its student population in roughly three years (the network was founded in 1994), K.I.P.P. is biting off more than it can chew. But the dollars from the Walton Family Foundation don't only enable K.I.P.P. ; they also contribute to the notion that private institutions--schools, hospitals, banks—universally perform better than public ones, an idea that feeds rhetoric and policies, but may ultimately make it more difficult for generations to climb out of poverty. Update: K.I.P.P. 's public affairs director, Steve Mancini, points out that, based on a survey of all hundred and nine K.I.P.P. schools conducted yesterday, eighty per cent "lose funding immediately for students who leave during the school year," while the others only count students once a year and "would keep funding if students leave during the school year." Second, K.I.P.P. schools receive public funds just as traditional neighborhood schools do and should not be considered to be "private schools." K.I.P.P. schools also receive philanthropic donations, and often in large sums, that help to fund professional development programs, building costs, and teachers’ salaries. The broader issue, though, is that however well the K.I.P.P. model works--and they do produce admirable results--economic inequality reverberates through the American educational system. There are many more children in America who are unable to attend K.I.P.P. or other charter schools. The Walton Family Foundation donation aims to increase capacity, which may end up being wonderful for future K.I.P.P. students. But what is America to do with the other children? I read amusing excerpts in last week's Wave from our newly minted Congressman's swearing in speech on November 13 at Queens Metropolitan HS where he declared "free enterprise, not 'capitalism [Huh? ],' is what our economic system is built on ... a free enterprise system is built on ‘intellectual capital’ and ‘sweat equity.’ It is intellectual capital, people have to have an idea and belief that something will work and can work and they can prosper." Well, whatever Turner wants to call it, whether we are talking about a free and unregulated enterprise system of crony capitalism or the privatization of the public school system, we have a mess. It's too bad Turner was at Queens Metro on a Sunday. If he had been there on a school day he would have found that the free enterprise school system instigated by WalBlackBloomKlein offers up fairly brand new school where kids had no regular schedules, were left in a gym "class" – taught by Chancellor Walcott's daughter no less - where they didn't get gym, a physics class "taught" by an unqualified special ed teacher, and no chemistry at all after the teacher quit in October. The principal actually did have an idea for a school that on paper seemed to offer a lot of good ideas. The only problem was that she was a grad of the Leadership Academy, the Tweed training ground for future principals ¬without a clue – with many people coming from Turner's vaunted "free enterprise" system without knowledge on how to organize or run a school. Of course, after Walcott and his minions ignored the problem for months - especial knocks to Queens HS Superintendent Juan Mendez (who was so arrogant at the Beach Channel school closing hearing last year) and network leader Gillian Smith – they finally responded – once the story hit the press. (I'm just scratching the surface here - read more on my blog). Free enterprisers sure know what is important. The oft-mysterious network management system - Turner's vaunted free enterprise system run amuck – deserves to come under scrutiny. A retired teacher left this comment on my blog: "The role of the network organizations MUST be investigated! New Visions, one of the biggest of the Children First networks, also runs charter schools in NYC and advertises constantly for new teachers with no credentials in a program that looks just like Teach for America. This is a clear conflict of interest. I taught at a small school in a poor minority neighborhood and even though students were without mandated classes or teachers (don't get me started on how the special ed kids were shafted) nothing was done to correct the situation. The school is still being run by a totally incompetent Leadership Academy principal with little teaching and no administrative experience. He was backed totally by New Visions." The school is in the old Jefferson HS – my Alma Mata – that was closed down to make way for four schools some of which - those that have not been able to cream the best kids – have been doing as badly or worse than the old Jefferson. But in Turner's world of free enterprise we now pay four principals instead of one. And how about Far Rockaway, another closed school (where we are paying 5 or 6 principals) where students at Frederick Douglas Academy VI have been complaining about not having an English teacher for 3 months? There are only 1200 unassigned teachers floating around the city called ATRs who were bumped from their own schools that closed but why hire a real teacher that you actually have to pay? Instead students are being taught English through a computer learning program called "iLearn", part of a massively expensive plot to eliminate teachers. When students have a question, they are told to "Google it." Rename the program "iLearnButNotOften." The Daily News reported that 75 seniors "have been warehoused in a bunk class with a different substitute each week and no coherent lesson plan...For weeks, students begged administrators at the C-rated school for a steady instructor, but their request was denied — until Friday, when they protested and refused to go to class until their demands were met." Replacing real teachers with computers is right up Bob Turner's free enterprise system alley. The computer programs are enormously expensive - and profitable - see one Rupert Murdoch who bought a company called "Wireless Generation" after Joel Klein as chancellor created enormous opportunities for the company – before being hired by Murdoch at $4 million a year. Free enterprise for the 1% but not free for us. The Frederick Douglas students learned their most important lesson when after an hour after their protest, school administrators, who had been ignoring their complaints, met with a delegation and agreed to hire an English teacher. Were the students inspired by the Occupy Wall Street movement, which we are beginning to see is having a more wide-ranging impact than on one square block in lower Manhattan? I'm betting they were. Make sure to see the full 8-minute video of the pepper spraying incident at U of California at Davis where the students shouted at the police in unison, "Shame on you" and "You can go." And the police actually looked shamed and left. How nice to see high school students in our neighborhood learning to use their power of numbers to accomplish something on a smaller scale. We hope to see them broaden their local concerns and join with students around the city who are beginning to stir – as are parents and teachers – against Bloomberg's dictatorship over the schools. All you have to do is read the short list of headlines Howie Schwach printed in last week's "The Rockaway Beat" with cheating from the school level to the NY State Ed Department running rampant (there can be bonuses for results in the world of free enterprise) as we see the results of Bob Turner's favored competitive and punitive free enterprise system imposed on the school system. Hey, Bob, don't you just love it when people with an idea - and with access to the right people – figure out how they can prosper? Norm will continue his parsing of Bob Turner in his Dec. 9th column. If you can't wait, he blogs at http://ednotesonline.blogspot.com. I attended the CUNY GA at the Graduate Center last night and they are looking for our support on November 28th. Below is an email sent out through GEM and NYCORE. Please forward info below widely to educators and parents. Apologies if it's repeat info for you. 25th Street and Lexington Ave, at 4:30 pm. The focus is to be on the intensifying police attacks on university students and protests in general, while also denouncing tuition increases. The exact time and place of the action will be decided at a CUNY-wide GA on Sunday, November 27. The GA also resolved to request that the PSC mobilize its membership for this action. I'll forward the formal statement when it is released. I hope it can be used to gain support from other teacher unions, as well. This call should be of great concern to all NYC teachers, students and parents. Beyond the implications of growing police repression for our democratic right to peacefully protest, many of you studied in CUNY schools and many of your students will go on to study at CUNY schools. Mayor Bloomberg, Governor Cuomo and Chancellor Goldstein's actions will close this door to most NYC students and render them voiceless to protest. We hope you will respond in force. I would also like to suggest that Occupy the DOE and other groups defending education attend the 3rd CUNY wide General Assembly, on Sunday, November 27 at 3:00pm at St. Mary's Episcopal Church, Harlem. Today, librarians from The People's Library at Occupy Wall Street (OWS) held a press conference with renowned civil rights attorney Norman Siegel to denounce the destruction and disappearance of thousands of books during the midnight raid last week on Liberty Square (Zuccotti Park). Staff and patrons at the people-powered library gave heartfelt testimony about the city's trashing of the library, which at the height of its operation had over 5,000 books, newspapers, zines, digital media and rare documents housed under a half-cylindrical covering donated by Patti Smith. 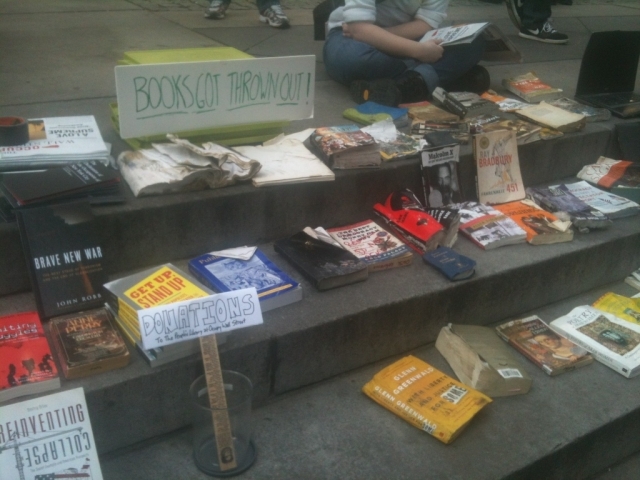 At the conference, hundreds of severely-damaged books were presented as evidence that the Bloomberg administration lied about its treatment of the People's Library during the raid. They claimed, through the Mayor's twitter feed, that the library items were "safely stored at the 57th St Sanitation Garage". In fact, thousands of books and other media remain unaccounted for and requests for information and comment from the City have not been returned. ~The Bloomberg administration must replace every single book missing or damaged, about 3161 books. ~The Bloomberg administration needs to acknowledge that a wrong was committed and this can never happen again. There is a formal press release coming in the next few hours on the OWS People's Library website. Video from the event is forthcoming, but preliminary (low-res) video available here and here. 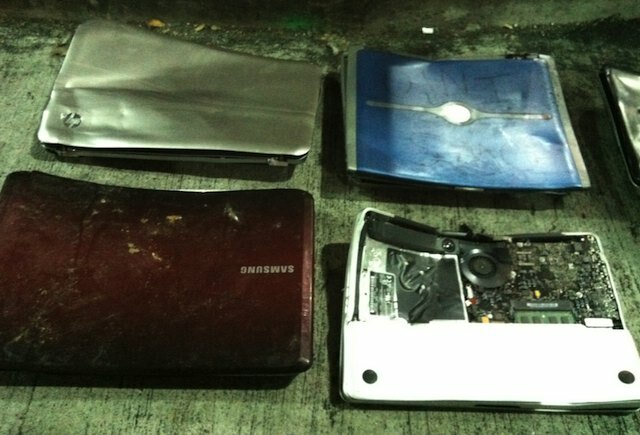 Ed Note: Let me remind you of the intentional destrucion of laptops that look as if smashed with a bat. We are less than one week away from the DOE hearing on the co-location of the Cobble Hill Success Academy, and we need ALL hands on deck to make sure we can pack the auditorium. Now is the time to fight for an Early Childhood Center in Cobble Hill and against Eva Moskowitz's Success Academy. (below is an email flyer you can forward). Can people share this on listserves and your contacts? Flood 'em with the FB page, on twitter and the flyer, its better if people hear about it 20 times. 3) The proposal for an early childhood center in the Global Studies building. The idea has been gaining a lot of support, so please circulate for feedback. There is also a second "Real School Choice" document that compares the Early Childhood Center with the Success Academy. COME FIGHT FOR QUALITY EDUCATION IN OUR NEIGHBORHOOD! Community leaders and educators are proposing a free public Early Childhood Center in the K293 building that would offer pre-K and kindergarten to children in local school zones. The Department of Education wants to give the space to Eva Moskowitz to open a Success Academy Charter School that would bus in students from across the district. Which would better serve the needs of neighborhood families? Early Childhood Center = Parent’s Choice! Bloomberg fits the Fahrenheit 451 book burning mode. What: Press conference to address the destruction of the OWS People’s Library by Mayor Michael Bloomberg during the 11/15 raid. *Photo Opportunity* All of the recovered, destroyed books will be at the press conference. Who: Norman Siegel will host and moderate. Speakers: Gideon Oliver of the National Lawyers Guild, Hawa Allan a Fellow at Columbia Law School, and Occupy Wall Street Librarians from the People’s Library. Law professors from Columbia, members of the American Library Association, various writers and others have been invited. So far, the People’s Library has received 1,099 books back from the Dept. of Sanitation after last week’s raid (some of which were not library books to begin with), and out of these, about 800 are still usable. 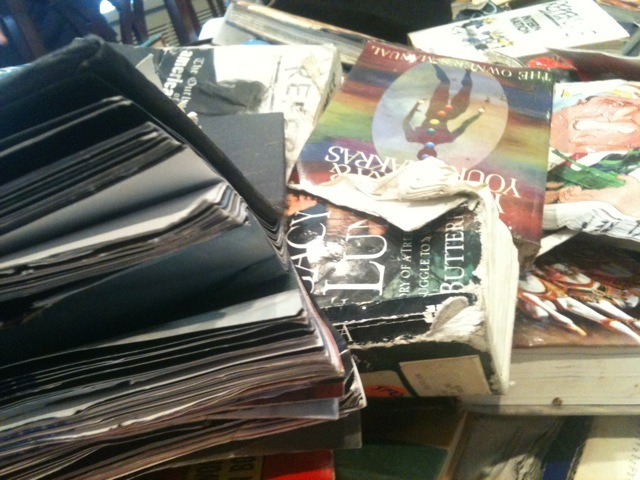 About 2,900 books are still unaccounted for, and less than one-fifth of the original collection is still usable. These numbers may change slightly when the People’s Library gets an exact count of the recent (and final) retrievals from Sanitation, but not considerably. 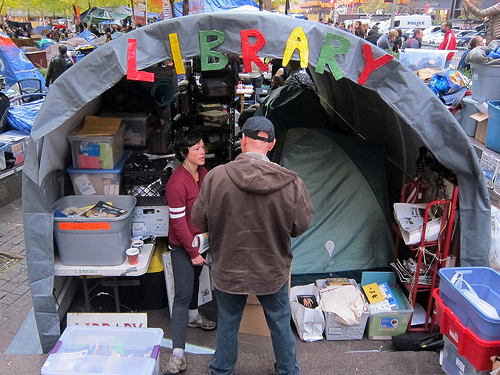 “The People’s Library was destroyed by NYPD acting on the authority of Mayor Michael Bloomberg on the night of the raid. In addition to all our supplies, laptops, and tent, they threw roughly 4,000 books into garbage trucks and dumpsters that were adjacent to the park, as well as assorted rare documents that were associated with OWS,” says William Scott, an Occupy Wall Street Librarian. Leonie Requests: Please send a message today about class size! Please send a message to contractsforexcellence@schools.nyc.gov today; protesting the failure of the DOE to reduce class size and have allowed class sizes to increase to levels that are damaging our children’s education and chance at success. The deadline for comment on the city’s defective Contracts for Excellence plan is tomorrow night, Wednesday, Nov. 23. Class sizes are now the largest they have been since 2007 in grades K-3, and are larger than they were when the state’s highest court said our children were denied their constitutional right to an adequate education in the Campaign for Fiscal Equity case, in large part because of excessive class sizes. In addition, we believe that there is $180 million missing from the city’s CFE plan, compared to the $531 million allocated by the state for this purpose. So far, four different Community Education Councils have passed resolution, protesting the increase in class sizes and DOE’s violations of law: District 1 in Manhattan, Districts 20 and 21 in Brooklyn, and District 30 in Queens. Some of these call for City Council hearings and others for State hearings on the matter. If you would like a sample resolution for your CEC or PTA, let me know; the one just passed by CEC 21 is here; CEC 1 is here. Again, the deadline for comment is tomorrow night Wednesday, Nov. 23, and DOE is supposed to send all the comments to the State Education department along with its proposed C4E plan. It is important that the state Commissioner know how dissatisfied parents are with the Bloomberg administration’s dereliction of duty to our children. A sample email is below; feel free to change it in any way you would like. Do it for your child, and/or all NYC public school children. And then have a happy Thanksgiving. As a parent, I would like to protest that class sizes have now increased four years in a row, citywide and in my child’s school, despite the fact that the city was mandated to reduce class size in all grades starting in 2007. This is the final year of the city’s five year class size reduction plan, and class sizes in the early grades are now the largest in eleven years. DOE has failed to allocate a single penny specifically towards class size reduction and instead has cut repeatedly cut school budgets, even when they received millions more from the state in C4E funding and overall education aid. The city’s refusal to reduce class size has severely damaged my child’s opportunity to learn. The state should immediately force the city to revise its Contract for Excellence proposal, by allocating the $180 million missing from the plan that the state provided, and use it to hire more teachers. The state should also implement a corrective action plan that would require the city exercise proper oversight and start reducing class size, instead of continuing to slash school budgets, eliminating thousands of teaching positions and wasting precious education dollars on failed programs that do not help our children learn, like more testing, technology, consultants and bureaucrats. Otherwise, the state as well as the city will have failed to do its duty by NYC’s children. The story at QMHS exposes many of the ills of the Bloomberg/ed deform takeover of our public schools. As predicted the swarm from Tweed and the Network descended on QMHS. It was not clear what they were doing but they did question some teachers and made surprise visits into classrooms. As if the tension in the school was tight enough. Still no programs but an elaborate plan was divulged to inform different parts of the school about the changed programs with students, of course being the last to know on Wednesday before vacation. The Gotham site is being used as a community board where there are personal attacks on parents and others. Late word is a rally against Levy-Maguire and the DOE on Tuesday after school. Groups were meeting all over the downtown area where they could find space. Revolutions always begin, he wrote, by making impossible demands that if the government met would mean the end of the old configurations of power. The second stage, the one we have entered now, is the unsuccessful attempt by the power elite to quell the unrest and discontent through physical acts of repression. The recent attacks on the Occupy movement - both physical and ideological along with the press emphasizing whatever negatives they could find - lots of people are thinking of the next phase now that there is on longer the need to run a small mini-city. 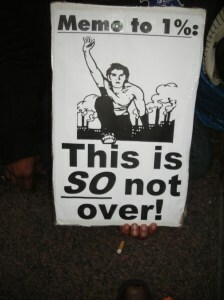 Repression didn't stop the Arab spring and it won't stop OWS - why? because all the issues that spawned it will only get worse - the 1% will get even more - more money, more bought politicians - and more people will get screwed and see the only answer is in grassroots political action. The lasting effects of OWS will be felt in the actions of the people who have been taking part - people who never would have met without OWS. There are so many subgroups on so many different issues it is hard to keep count. Today I saw lots of signs of where we are heading: groups being formed dedicated to developing a democratic bottom-up decision making process to keep the maximum number of people involved, something so antithetical to the operation of unions, especially the UFT, which is trying to glom onto the movement - I should say coopt it (Monday they are holding a 10:30AM "dialogue" with OWS where they will probably try to convince them the most important thing they can do is go to Albany for lobby day. I went into the city for the 12 noon meeting of the Occupy DOE group which has been meeting in the atrium at 60 Wall St. only to find the sudden cleaning bug has bitten there too. With half the atrium closed the meeting had to be moved to Zuccotti Park where we met at the notorious west end where the drummers used to hang out. They had things to do with a visit to Bloomberg's neighborhood (Sunday 2PM: 24 Hour Drum Circle at Bloomberg's Mansion). When I got there I asked a cop how to get in since it looked all fenced in and he had the nerve to say, "I'm not sure if we're letting people in." I usually don't get nasty with cops but that ticked me off - a sign of how much good will towards cops has been worn away. I found my way in - and noticed lots of Brookfield properties private security guards in yellow vests walking around. Zuccotti was having holiday decorations put up and there was also some noisy cleaning going on. Most of the action was on the east (Broadway) end so we were able to find a space in the northwest corner of the park. It was a smaller group than usual. We had people from ICE, GEM, NYCORE, GEM and Teachers Unite along with non-affiliated people. I won't get into the details of the meeting - the group will try to meet every Sunday - next week it will be at 4 or 5PM with an attempt to try 60 Wall Street again. Which is where Gloria and I headed over to hold a short meeting about GEM stuff after the ODOE meeting. The north end of the atrium was not being cleaned. We noticed at least 2 fairly large groups meeting - we didn't find out what their focus was. And right outside another group was meeting on the sidewalk - everyone standing and waggling fingers. If there is any sign that the Bloomberg invasion of Zuccotti has not made a dent in the activities going on behind the scenes this was it. People gathering all over the place to start doing the real hard work of educating, organizing and mobilizing - and no mater how much the press and 1% try to brand the people who are taking their Sundays - and probably many other days - to do grassroots political work - they cannot stop this movement. Having had a brief dose of the Obama mania in 2008 where all kinds of people were racing around to work for Obama, that work came to an end with the election. The 1% will continue to get a bigger share of the pie and continue to buy their politicians and this movement will see that lobbying people who are bought will get them nowhere. My mantra is to show up at their offices with a thousand people. We may be pockets of 20-50 but I saw lots of these pockets today - the continued growth of the movement no amount of billy clubs, pepper spray, or smashed computers with hammers will stop. -the untruths and the lies. It will be important for as many as can to attend the hearings at K293 on 11/29 in cobble Hill and PS 59K on 12/6 in Williamsgurg/Bushwick), both at 6 PM. Eva Moskowitz was advertised to speak at this 'discussion" session." She never showed. But her representatives who come to most of these sessions did because Eva can't take the heat. Jenny Sedlis, Sean and two unidentified others were present with their smiles and handshakes. Before we began David and I spoke with Jenny about what school(s) BSA was planning to go into. She said it wasn't PS 59 (as they knew they are going in there). She spoke of that invasion as a done deal. She mentioned Cobble Hill, but said this discussion was about another school to go into the Williamsburg area. She mentioned that they were aware of what schools were 'underutilized," but would not say which schools they were (as if we didn't know - PS 19 and PS 84 for starters). She would not say again what school and claimed ignorance of having not been told by the DOE yet later on in the question session. She also knows that the schools near the meeting site (PS 31, PS 34 and PS 110) are overcrowded. What a perfect community to cream and skim because parents have difficulty getting into these "good' schools. She claimed the relationship with the co-located schools at the IS 33 campus was good. We have not heard anything in the community about BSA there. We also have no contacts at the IS 33 campus and the school seems to keep a low profile (at least outside the building - no signs or banners advertising the school). She recognized David after a few minutes and remembered him from the CEC meeting held a while back. Disturbingly, she referred to his connection to the UFT all throughout the question period. She blamed the UFT : they do not like our schools and do not want them to exist. I had to stop her to let her know that we were not there representing the UFT, but we were there as interested parents, community members and teachers in the community. After the session, David spoke privately with her and warned her not to do that to him in public again. Out of the 13 people there, three of us were teachers (one from PS 34) and two or three parents from the PS 34 community. The others did not identify themselves publicly. Jenny spoke of how Harlem Success Academies are "progressive and traditional." She spoke about how the reading program emphasizes comprehension and "the robust writing program." Both of these are based on the Balanced Literacy model. She mentioned the math, science, art programs as well as the trips children take to "fuel their writing." She never mentioned a social studies program. The school also offers soccer and basketball. She spoke about the school structure and the longer day. She claimed that they have 57,000 applications for teaching positions and that most of them come from NYC and from teachers disillusioned with the public school system She explained how principals for their schools are trained and how new schools are staffed. She was emphatic that they "only go into space where existing schools can maintain their programs." Then the question period began and Ms. Sedlis had to be on her toes. Most people were not buying her line. Some folks had to be reminded that the reason they could not get Pre-K or K seats for their children was because the DOE chose to reduce those programs in many of our District 14 schools. She spoke about the lottery system and the priorities. There will be 190 K and grade 1 students, but there is flexibility in the number of classes set up according to registration numbers for each grade. Class sizes are 25-26 children. Asked about the large class size (when we have smaller class sizes in the district), she replied that the "quality of the teacher determines the quality of the education despite the class size." People wanted to know why we (the city/DOE) are not combining resources for our children and schools. Why are we separating them? "This school is a cultural diversion," said one parent. The students of HSA?BSA are kept separate from the public school children except for "structured large sharing times: parades, assemblies etc. The question was raised about how charters can ask students to leave while public schools cannot. Jenny bristled when David mentioned the Matthew Sprowel expulsion. There is concern with what was going on in his large kindergarten class that allowed for this and where his needs were not met, as well as not recognizing that he was gifted. "He was NOT expelled. The UFT does not like our schools, it doesn't want them to exist. She was coached by the UFT. The child was not kicked out. That's not the truth." Jenny also mentioned the incident of the large number of teachers that left one school. She couldn't give a clear answer. She mentioned that the schools don't have the city pension system, but have a 401K and that the schools tend to attract teachers with less than 15 years experience. Children have to take the state tests. The school has to prove how the curriculum aligns to the CCLS. Ms. Sedlis was asked about High Stakes Testing in the HSA networks and about whether they thought about going with project based assessment as an alternative to the tests and whether they planned to seek an exemption as some other schools have from HST. She answered that they do have project based learning in the "later grades." But that they need objective measures (tests) "and they are worthwhile." The state math test is low bar. The ELA is a better measure. We Want to make sure our children can pass the tests for competitive high schools. Tests are not necessarily the focus. The longer school day provides for the science and arts. The fact that the state tests are not aligned with authentic instruction was discussed. Jenny retorted with, "Our oldest children are in sixth grade (this is the first year for 6) We'll have to look further as we go toward grade 8." The teacher from PS 34 said, " I haven't heard the innovation. What are you offering that is different from our neighborhood schools?" She really couldn't answer this except that they provide a "choice." They attract teachers with 3 or less years experience who are discouraged with the public school system. Will you be subject to following the Danielson Frameworks? (She had to be told what they were.) No they would not have to follow these for evaluations. Principals are instructional leaders. There are other people who take care of the outside business. Teachers are observed each day under a non punishing evaluation system. One father said he could feel the tension present and he asked how this tension would affect the people in the school building and the parents. He expressed the fact that parents often sacrifice to have their children in a safe, non-violent environment. He feared that the children would be put in between the tension. Jenny's answer to him was that there was a lot of "nuance, an us vs. them." She did admit there were many good things going on in the Public school system. Then she brought up that only 54% of the PS children are passing. Several people said that tests should not be used as the standard of success. Someone mentioned that the public schools have not been allowed to expand and the conflict agenda has been created by design. Sedlis admitted that we don't like the conflict. She told us that HSA experiences the fight before they go in, but once the principals sit down, they work together and "there is no conflict." if there were, "we would address any conflict immediately." On this comment, the meeting was ended. The HSA reps stayed around for questions. I was able to hand out several of the GEM Truth About Charter School pamphlets to some of the parents there and the PS 34 teacher. David spoke further privately with Sedlis. One thing she told him was that HSA was also relegated to the basement in one of the schools. The students in PS 241 were "relegated" to the basement for two years in order to provide HSA with prime space in the building. Preference was given to HSA students at then expense of PS 241 students. Only after much press on this issue- including a segment on it in the highly acclaimed and widely viewed "Inconvenient Truth About Waiting For Superman"- as well as a visit to the school to view the situation from Walcott himself, did the HSA students get "their turn" in the basement of the school. But do not feel badly for them, it was space taken away from the PS 241 students (not swapped out) as HSA pushes them out of more and more space in the building AND HSA put tens of thousands of dollars of renovations into the space that DOE did not feel necessary for the PS 241 students when they occupied the space-including a brand new, renovated bathroom that Walcott promised they would NOT be allowed to renovate!!! !